The well-known postural reflexes in the neurological examination of new-born babies are reflex postures and movements provoked by a definite change in body position. They undergo modification in each stage of development, i.e. they proceed in different phases. These phases are objective milestones in development. Since we are dealing with complicated reactions, it is terminologically better to speak not of postural reflexes, but rather of postural responses. In normal development, the postural response phases correspond to whichever stage of phasic motor activity and locomotor ontogenesis development that has been reached. This should be emphasised because postural responses in paediatric neurological examination give a quick and informative picture of the child’s developmental state. 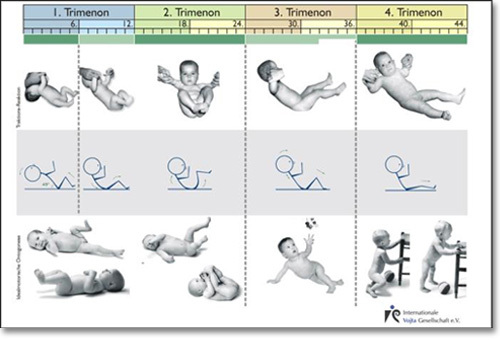 Seven postural responses, which are already applicable in new-born periods, are regularly used. These are described in order of significance. Stimulation: Raising the child out of a prone lying position and quickly tilting it to the side from a vertical to a horizontal position. For clinical application, assessment of the upper extremities is more important. A Moro-type embrace movement with both arms, hands open. Flexion of the overlying leg in the hip and knee joint with dorsiflexion in the upper ankle joint. Pronation of foot with toes spreading fanned out. Straightening of the underlying leg with dorsiflexion in the upper ankle joint, supination and flexion of the toes. The Moro-type embrace movement subsides, the arms are still abducted, the hands are open. Arms loosely flexed (the Moro-type stretching of the arms only still appears in repetition or agitation). Little by little the legs take on a flexion posture. Toes on the overlying foot no longer spread. All extremities take on a looser flexion posture. Hands open or loosely closed. Toes in a neutral position or flexed. Arms loosely flexed, later slack advance and retraction. Legs markedly stretched out, flexion in knee joint subsides. Toes in a neutral position. The Vojta Reaction hardly applies any longer in a healthy child once it is able to stand. The child can consciously modify its body posture despite the massive afferent inflow. Before performing the manoeuvre, it is essential to open the child’s hands. 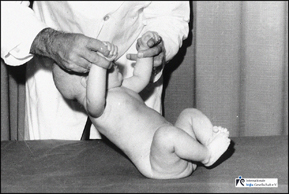 Otherwise, particularly in the perinatal period, but also in early infancy, there is a stereotypical flexion posture in the arm that could be falsely interpreted as abnormal. 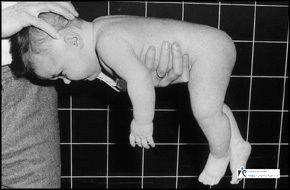 This test has been used in diagnostics for decades in order to assess the posture of the head in a child raised out of a supine lying position to a vertical sitting position. If, however, the child is pulled up to a sloping position (approx. 45 degrees from the horizontal), it is possible to observe the reaction of the whole body and the extremities in this unstable position. Care must be taken to bypass the grasp reflex of the hands. 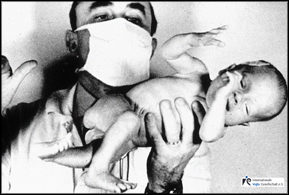 To do this, a finger from the direction of ulnar side is placed in the child’s hand. With the other fingers, the child’s distal forearm should be grasped without touching the back of the hand. This exteroceptive stimulus should circumvent the grasp reflex. Starting position: Supine lying position, head in a neutral position. Stimulation: The child is slowly raised up to 45 degrees. 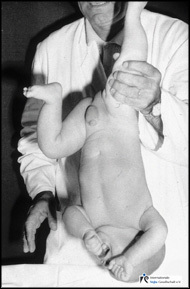 In the perinatal period, the legs are flexed and slightly abducted. 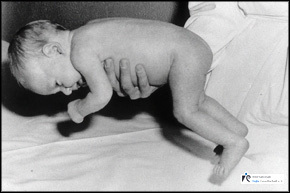 inert flexion posture of the legs (similar to that in the axillary suspension test or in the Landau reaction in the 1st trimester). Flexion of the head with flexion movement of the whole trunk. Head and trunk are aligned. Legs maximally pulled up to the trunk. After the 7th month, the flexion movement of the head, the trunk and also the legs gradually subsides. 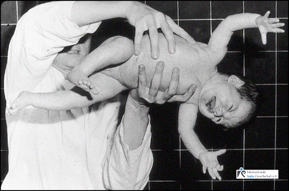 From then on, there is an active impulse on the part of the new-born baby to “pull itself up” during the manoeuvre. The subsiding of the flexion movement in the legs can best be observed at the knee joints. (Half extension in the knee). The centre of gravity is—actively—shifted towards the buttocks. 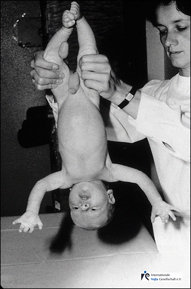 The child pulls itself up. The head remains aligned with the upper body. The flexion movement is accomplished primarily in the lumbosacral transition zone. The legs are abducted and loosely extended in the knee joints. For assessment of the 3rd and 4th phases, the child should be in a stable mood since it can often opisthotonically hyperextend the trunk when crying. Starting position: In the first 4-5 months a supine, thereafter a prone lying position. The head should be in a neutral position with the hands opened. 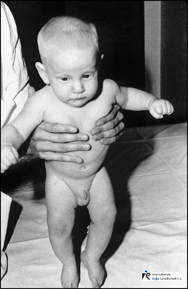 Stimulation: In new-born babies and young babies the thigh is encircled far proximally, in older babies and infants, the distal thigh or the knee joint. Then the child is suddenly brought head first to the vertical. Moro-type embrace movement of the arms (Phase 1a). Incomplete Moro-reaction of the arms (without the “embrace”). Neck and trunk extended up to the thoracolumbar transition. Flexion posture of the pelvis subsides. High stretching up of the arms. Symmetrical neck and trunk extension up to the lumbosacral transition. 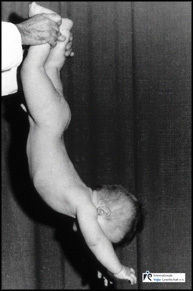 The child actively tries to hold on to the examiner and pull itself up. In the 1st trimenon, the upper arm is perpendicular to the body axis. This angle gradually increases in the 2nd trimester from 90 degrees to 135 degrees. It reaches approximately 160 degrees at the end of the 3rd trimester. The reaction is assessed at the moment the child is raised. Before each examination the hands must be open, particularly in new-borns and young babies. It is imperative that children under 5 months be examined out of the supine lying position to cope with the still existing pelvis flexion posture. A child over 6 months is more favourably examined out of a prone lying position since it has less opportunity to hold on to the examiner. Starting position: Supine lying position. 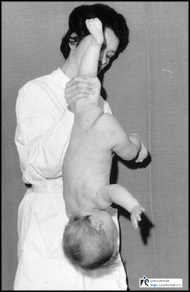 Stimulation: The child is held by one knee (in young babies by the thigh close to the hip joint), and suddenly brought head first to the vertical. in the hip, knee and ankle joint. in the knee joint, the hip joint remains flexed. 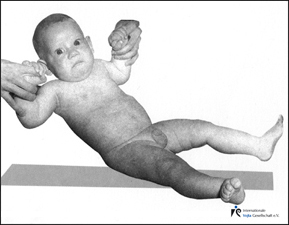 Procedure: The child is held by the upper arm and thigh on the same side proximally near the joint. To avoid overstretching the joint capsule of the shoulder joint, one should wait for the child’s “help”, i.e. when it tries to pull its non-free arm to its body. In the first 6 weeks, Moro-type movement of the free arm. In 7th to the 9th weeks, Moro-type retraction of the arm. In 10th to the 12th weeks, loose flexion posture of the free arm. Note: Loose kicking movements in the free leg are normal in this time. At the end of the 2nd phase: Weight taken on the supporting hand. Leg remains in flexion posture. The 2nd phase—pronation movement in the free forearm—begins once the child is capable of supporting itself securely on its elbows with symmetrical neck extension in a prone lying position. The pronation posture of the forearm is always linked with dorsal flexion in the wrist and slackening of the fist position. Complete hand support (without stiff extension in the elbows) decreases at the same time that the grasp reflex of the hand ceases to exist and the child is capable of phasic radial grasping. Abduction of the free leg in the hip joint. Support on the outside edge of the foot (8th month, see illustration above). Support with the whole of the sole of the foot (beginning of the 4th trimester, see illustration below). The 3rd phase appears simultaneously with the standing reaction. 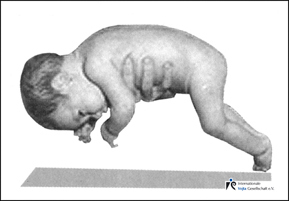 The phase of development that it indicates is clinically existing verticalisation. The child can now sit up alone and tries to pull itself up. 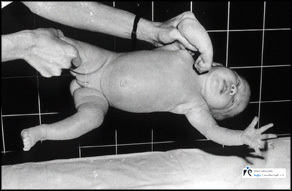 Procedure: The child is held in a precise horizontal position under the abdomen on the flat hand. Arms and legs loosely flexed. Symmetrical neck extension up to the shoulder line. Slight flexion posture of the trunk. Loose flexion posture of the arms and legs. Further symmetrical extension of the trunk up to the thoracolumbar transition. Legs in slight abduction and loosely flexed (hip and knee joints approx. 90°). Subsiding of leg flexion after the 7th month. While implementing and applying this postural response, it is once more imperative that the child is calm. The extension posture of the legs or an opisthotonus-like posture of the trunk that appear while crying are of no diagnostic value. With the completion of the 2nd phase, the child is capable of adopting symmetrical elbow support and symmetrical neck extension in the prone lying position. Any asymmetry in the trunk posture that occurs is to be noted. Completion of the 3rd phase also means the linear posture of the spine. At this time, the child must already have a phasic radial grasp and be able to support itself on one elbow in the prone lying position and be able to grasp forwards with the free hand. that the examiner does not let his thumbs touch the lower edge of the child’s trapezius since this proprioceptive stimulus stimulates an extension posture in the legs. 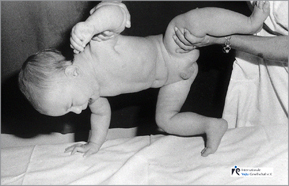 Legs in inert flexion posture (similar to Landau in the 1st phase and in the head control after the perinatal period). Legs raised to the body—flexion synergy of the legs (posture similar as in the Landau reaction or in the head control in the 2nd phase). Legs in a loose extension posture. The phase of development that pulling the legs up to the abdomen in the 2nd phase corresponds to is spontaneous motor activity, when the child pulls its legs up to the abdomen in a supine lying position and begins to intertwine its feet. The 3rd phase appears in preparation for the standing reaction.